It’s safe to say that seeing Apocolypse Now as my first Cine/Club experience left me completely blown away and guaranteed my further (voluntary) interest in Cineclub’s films. Coming in, I had expected my first film viewing to be tedious and boring, having never seen or heard much about Apocolypse Now and having been informed that the movie would be “really, really long.” Instead, I found myself completely engrossed in the story of Benjamin Willard, an army captain who is sent on a mission by his military superiors to “terminate” a colonel gone rogue. I was perhaps even more absorbed in the images of the film, from the brilliant pain and insanity of Willard in the opening scene to the ominous shadows obscuring the face of the colonel, than the plot itself. These images, combined with the frenzied and panicked rhythm of the soundtrack, left me with a deep feeling of uneasiness and tension that heightened both the film and the film viewing experience in the best possible way. (Midori) Never had a film left me so completely and utterly terrified as Apocalypse Now had. Coppola’s use of imagery, motif, cinematography… Even something as small has failing to focus the shot on something left me gulping for air. Anyone who has ever watched almost any film with me can tell you that I cry. A lot. 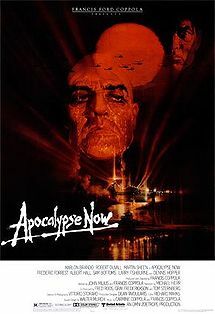 I get easily carried away by the plot, by empathy for the characters (part of the reason why I love going to Cine/Club), but during the entire run of Apocalypse Now, I didn’t cry. Horror left me in a state of shock, hopelessly gaping at the screen, and flinching almost constantly at the scenes. It’s definitely a movie I will carry with me for the rest of my life.